As a demographer, it is appropriate that Lam should focus on humans. However, I fear that he has largely ignored the environment in which we live when he wrote this essay. I have difficulty accepting his statement: “An important source of optimism about the world’s ability to support an additional 4 billion people is the success in supporting the previous 4 billion.” My concern is that the past 4 billion have degraded natural world upon which we depend, and that this degradation will make the world much less welcoming to the next 4 billion. Borlaug’s three decades have passed and we have seen the side effects of the “green revolution”—decreasing soil quality, decreasing forest coverage, increasing pollution (including huge anoxic ocean dead zones), rapid loss of species and, perhaps worst of all, climate change. The “green revolution” has allowed us to feed more people so that, finally, fewer people go to bed hungry. However, more food has made it possible for our human population to grow at a faster rate, despite monumental increases in reproductive health and family planning. How can we quantify human impact? The formula popularized by Ehrlich and Holdren (1974) gives an idea of our human impact on the earth: I = P x A x T (I = impact; P = population; A = affluence (or consumption); T = technology). Let’s look at these factors in the opposite order. We are starting to develop technology to decrease our impact, such as solar panels and more efficient vehicles, but the benefit so far from new technology is relatively small. As for the A factor, affluence, I have met very few people who actually wish to decrease their consumption. There is too much social pressure for people to increase their consumption. Furthermore, leading an affluent life is more comfortable so it has become the goal of billions of people. Slowing population growth, on the other hand, is the “low hanging fruit” to reduce human impact P. An estimated 225 million women worldwide wish to avoid pregnancy but are not using effective contraception (Singh et al. 2014). Moreover, having fewer offspring has been shown to be the most effective way of reducing impact, using greenhouse gas emissions as a measure of impact (Murtaugh & Schlax 2009). How can we determine to what extent human activities are degrading our planet? 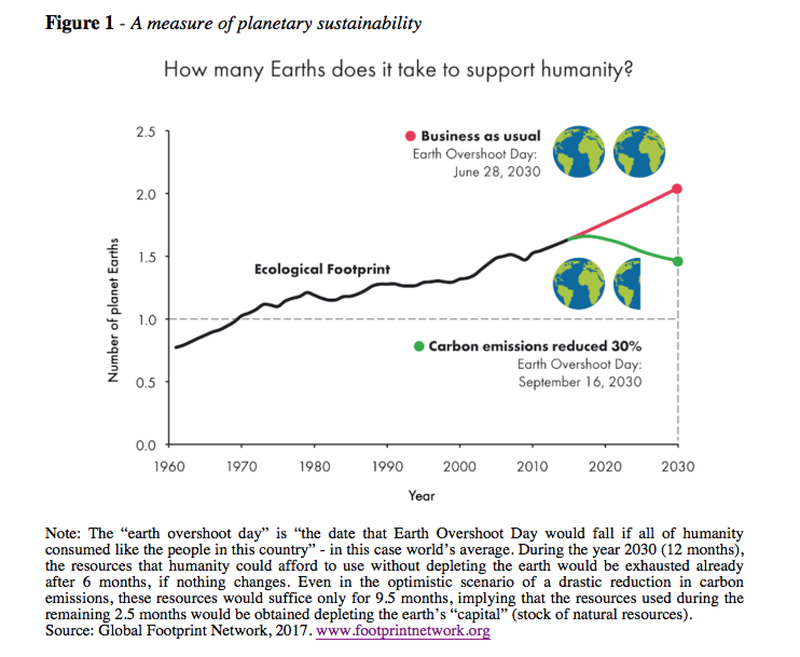 The best measure of planetary sustainability is the Ecological Footprint. This shows that humans are already overtaxing the planet. 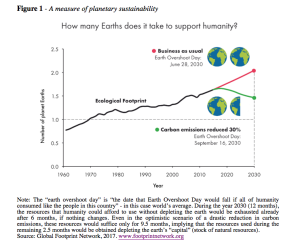 Indeed, it would take 1.6 planets Earth to support our human population sustainably the way we are currently living (Figure 1). Unfortunately, there is only one Earth. This degradation of our life support system will become a grave problem as the next 4 billion people are added. There will be more people to share the resources and more people to contaminate the world with their waste products. The most visible of the latter is the climate change caused by carbon dioxide from our use of fossil fuels, but there are many other examples. Already food production systems are stretched to keep up with the addition of about 80 million people each year. With global warming, the outlook for increases in food production in some African states is poor. Feeding even 9 billion by midcentury will clearly be a major challenge. We have been fortunate to live in this era, but I fear that the next 4 billion people will live in a world that is very different, and not so enjoyable. Current inhabitants must think more about preserving the earth for future generations. As most readers know, this debate is not new. In 2013, Professor Stan Becker challenged Professor Lam after his presidential address at the Population Association of America in 2011 in which he forecast “I expect that it [the world] will have improved in many ways, including lower poverty, higher levels of education, and plenty of food to go around” (Lam 2011:1259). Drs. Lam and Becker have a wager on food prices (collected by FAO) over the period 2001-10 to 2011-2020, with Lam predicting they will go down and Becker predicting they will go up. Half of the period of interest has passed (2011 to 2016), and prices have risen, by about 51% globally (Table 1). Lam D. 2011. How the World Survived the Population Bomb: Lessons From 50 Years of Extraordinary Demographic History. Demography, 48(4): 1231-1262. Murtaugh P.A., Schlax M.G. 2009. Reproduction and the carbon legacies of individuals. Global Environmental Change 19: 14–20. Singh S., Darroch J.E., Ashford L.S. 2014. Adding It Up: The Costs and Benefits of Investing in Sexual and Reproductive Health. New York: Guttmacher Institute. Becker S. 2013. 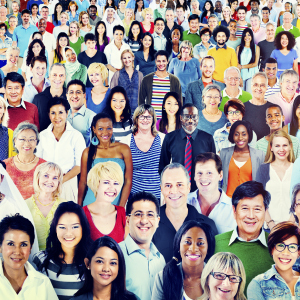 Has the World Really Survived the Population Bomb? Demography. 50(6): 2173-2181. Figure 1– Global Footprint Network, 2017. Tab 1 – Fao.org See Spring, 2017 PAA Affair at http://www.populationassociation.org.